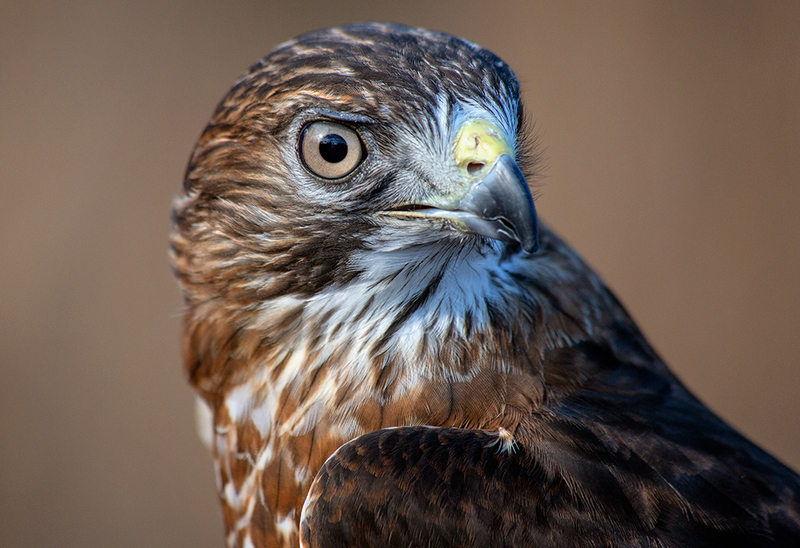 Xtreme Raptor Day is an annual festival that celebrates birds of prey. I attended my first Xtreme Raptor Day last year and was immediately hooked. The spectacle of seeing these fascinating birds up close is certainly center stage, but I was equally taken by the people. Although the festival is about the birds, it clearly is for the people who flocked (sorry, I couldn’t help myself) there to see the raptors. I’m told there were over a thousand visitors that day. There is obviously a lot of enthusiasm for the kind of wildness these birds represent that I find invigorating. 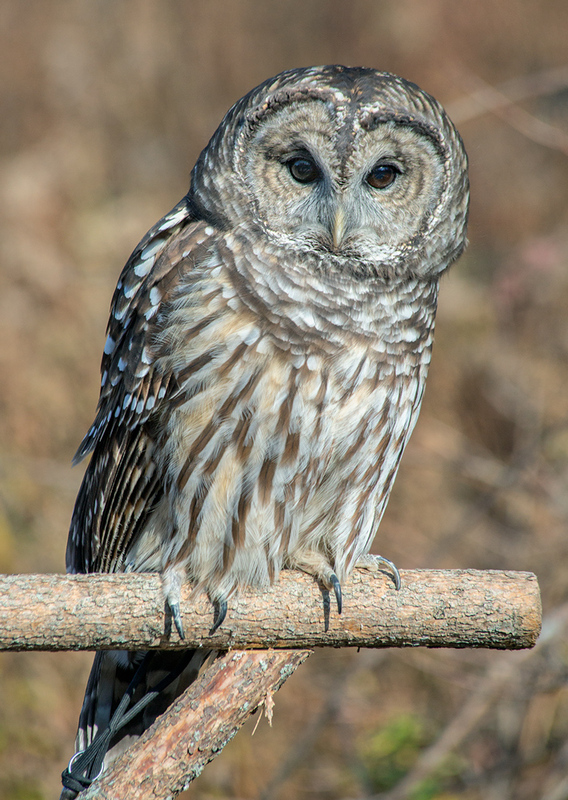 This is Orion, a Barred Owl. Orion was still a nestling when he had to be rescued after his tree was blown down in a storm. He was “imprinted” on humans at an early age, habituated to depending on people for food and therefore unable to hunt in the wild. Orion is the center’s ambassador for a species that is particularly hard to spot in their natural surroundings. Not only are they nocturnal, like most owls, but remarkably well camouflaged. The amphitheater was the site of several popular raptor shows during the day. 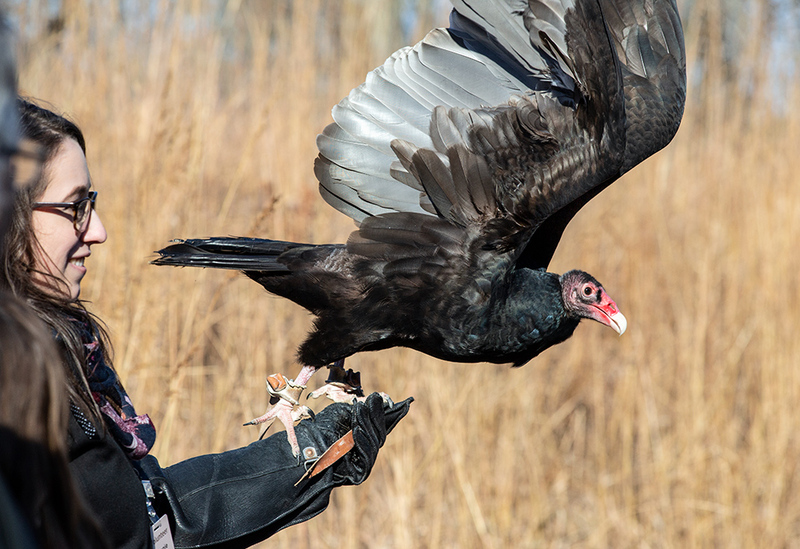 This is Tallulah, the Turkey Vulture, taking off during one of her flight demonstrations. Vultures are not raptors since they feed on what is already dead. They are naturally social creatures and Tallulah has decided to adopt humans as her own personal social group. What does that say about us? I have to wonder. 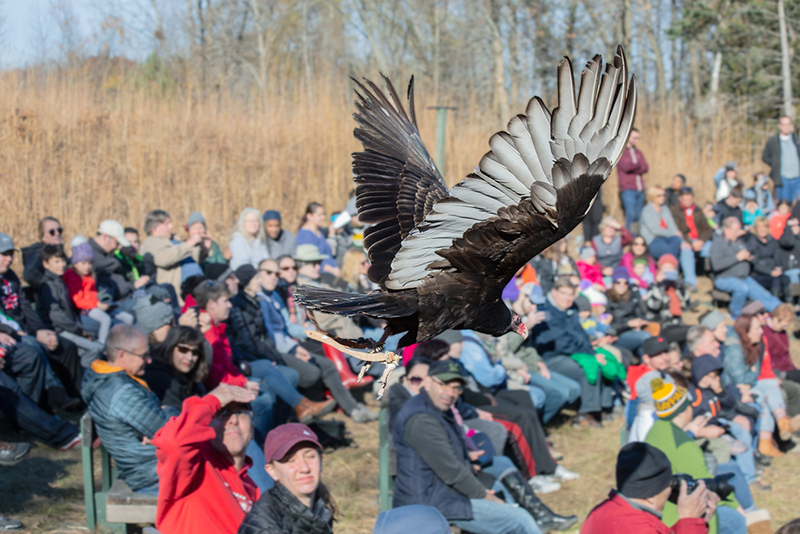 One of the highlights of the raptor show at the amphitheater is when Tallulah skims low over the heads of the audience. Don’t raise your hands or cellphones while she is flying, we are warned! 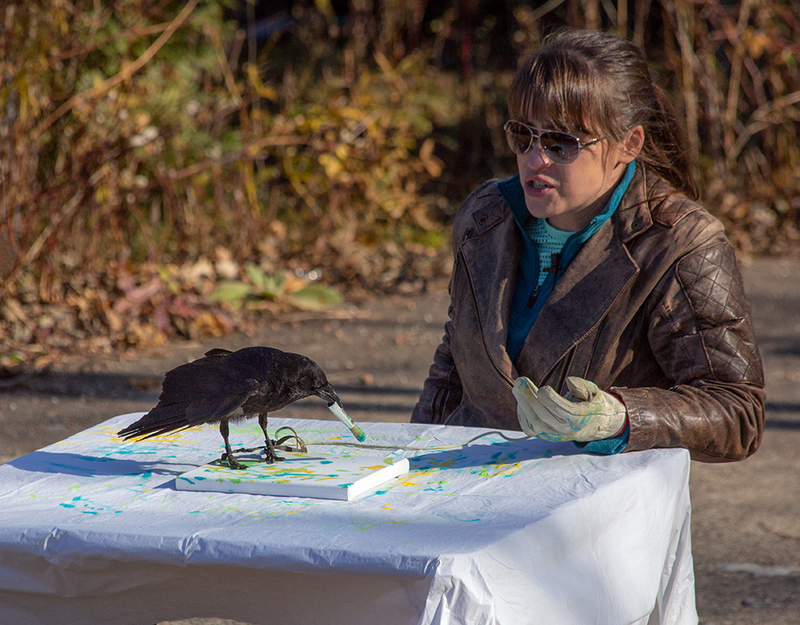 Another non-raptor featured in the show is Loki, a very talented American Crow. While the crowd watched, Loki painted an abstract work of art. 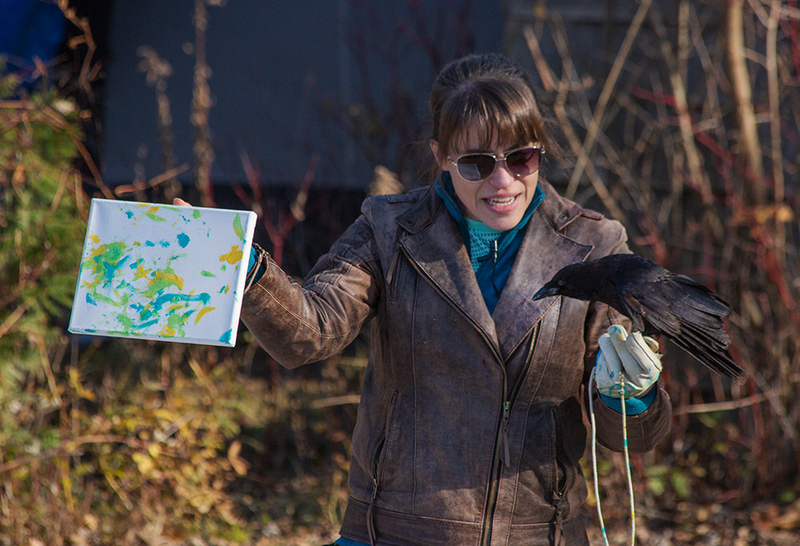 His artistic talent has earned him the nom de plume “Crowcasso,” according to his trainer, Lindsay Obermeier. Lindsay and Loki show off the completed masterpiece to the admiring audience. 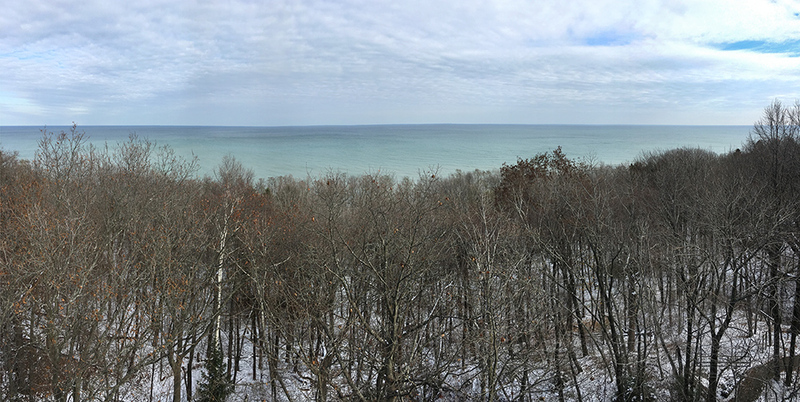 Although the raptors clearly got top billing for the festival, the Center’s 185 acres of forests, wetlands, prairies, ravines, bluffs and beach are always on display. The 60-foot tower rises over the canopy to provide a 360° panorama of lake and land. 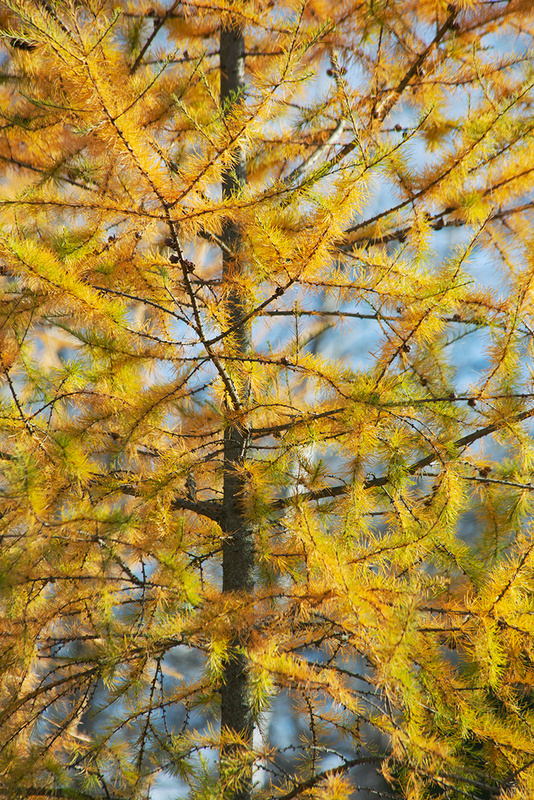 The tamaracks were especially resplendent in their autumn apparel. 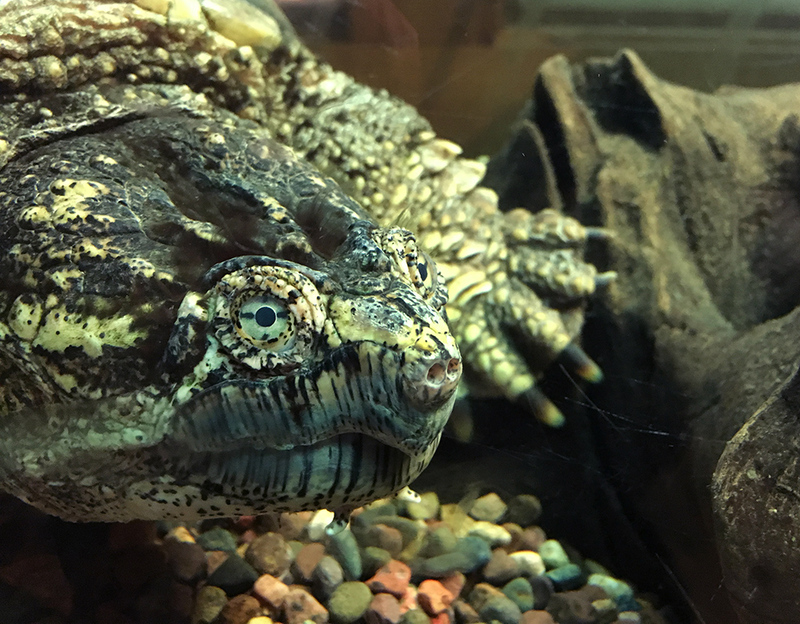 Indoors you can visit with a number of turtles, including this large snapper. Although Xtreme Raptor Day comes around only once a year, there are other occasions when some of the raptors can be seen, including Veteran’s Day. 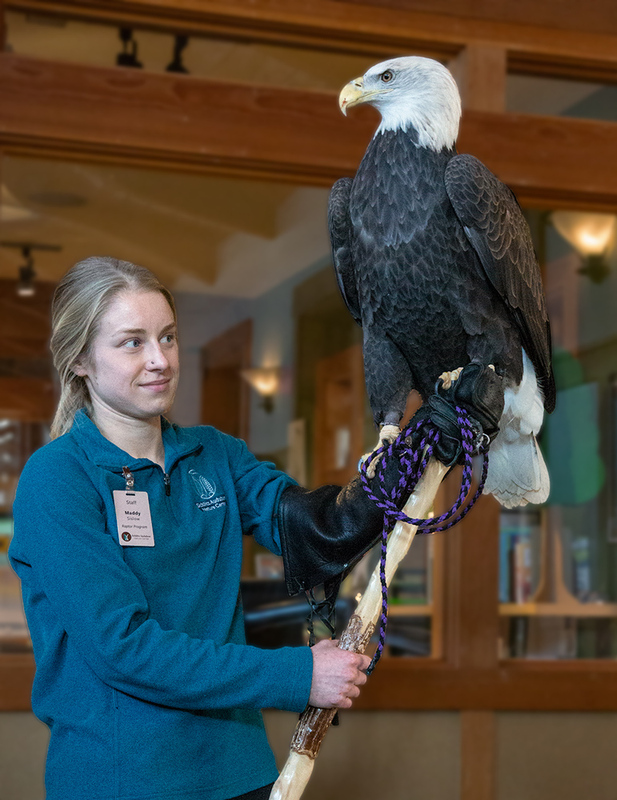 Because I missed seeing the Bald Eagle, Valkyrie, during the festival, I went back on Veteran’s Day for a “meet and greet.” Here she is posing with her trainer, Maddy Sislow. Valkyrie, who is one of two Bald Eagles at the Center, had to be “rescued” after she learned that food could be gotten from people. Because eagles, being sharp of beak and talon, can be a danger to humans, there was a warrant for her arrest, we were told. And so she now lives at the Center where we have the great fortune to witness her majesty up close and personal. My seven-year-old granddaughter, who accompanied me, was most impressed when Valkyrie lifted her tail feathers and ejected an enormous stream of white poop onto the tarp on the floor. I didn’t catch that in a photo. You’ll have to go there sometime and see it for yourself! 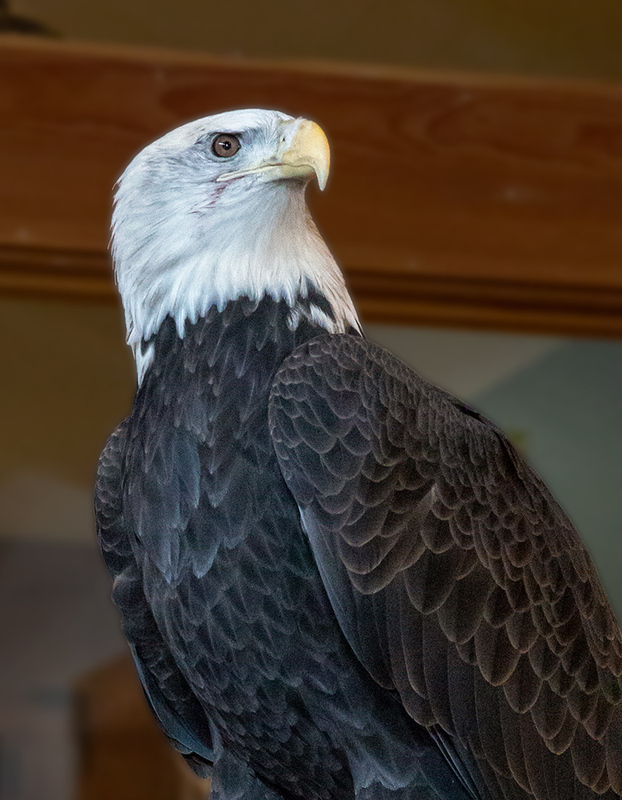 You can read much more about the birds in this story and all 17 avian residents of Schlitz Audubon Nature Center on their website. 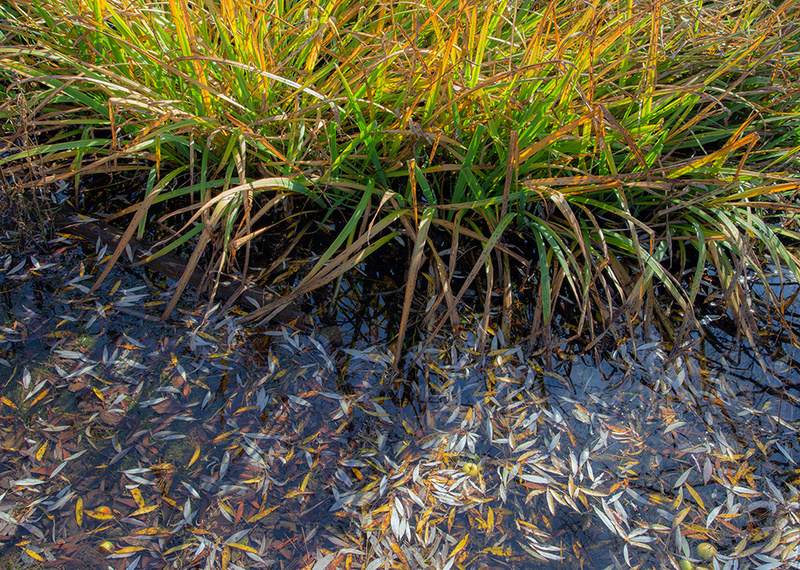 There also is a Schlitz Audubon Nature Center page on our website. Eddee Daniel is a Preserve Our Parks board member and project director of A Wealth of Nature.